Wildlife | Northwest Navigation Co.
On our way from Farragut Bay where we picked up our week’s supply of organic veggies, one of our guests noticed a whale’s spout. We stopped for a few minutes and we were rewarded with the opportunity to watch two humpback whales working together to trap schools of fish in nets made by blowing air bubbles. 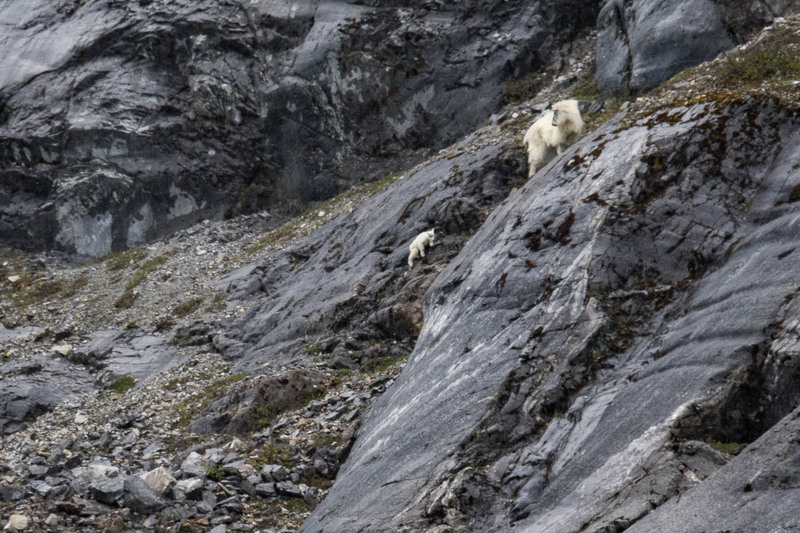 We were cruising alongside Gloomy Knob in Glacier Bay on our AdventuresNW Magazine Photography Workshop when spotted this mother mountain goat waiting patiently for her youngster to catch up to her. It was a nice opportunity to observe these amazing sure-footed creatures and also to try to photograph them as they were high up on the mountain-side and we were at sea level. We have several photography workshops aboard the David B in 2019. 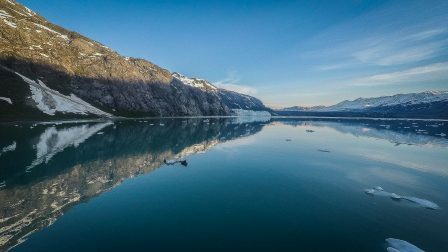 We’ve really come to love these trips as photography brings you a depth of experience with the beauty of Glacier Bay, as well as providing you the time to slow down and observe nature while learning how to get the most out of your camera. If you think you would like to know more about our Photography Workshops and instructors, click on over to our photography page for dates and locations. More than anything else, I love to be in places where I can observe animals. For me, every encounter with wildlife is special. Most of the time these encounters are nothing more than a brief glimpse or a snapshot into a creature’s daily routine. But each time I observe I learn something new about animal behavior and also about myself. I find bears especially captivating. I love watching how they move, how they make decisions, how they find food, and where they choose to be. I love watching old bears, and young bears, baby bears, and mama bears. I love watching brown (grizzly) bears and black bears equally. Some encounters stand out. 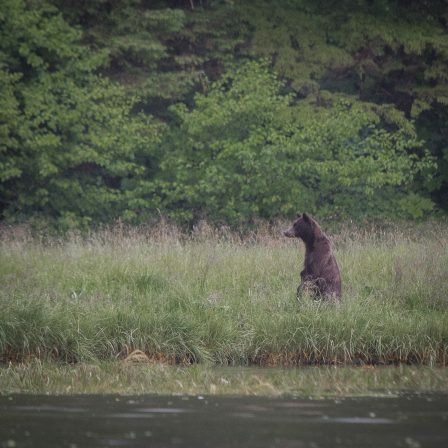 In July this past summer, it was a was a young brown bear. We’d been watching it through binoculars from the David B the night before. The bear had come down to the beach at low-tide to try its hand (or paw, I should say) at fishing. It was alone and seemed to be new at the solo-life of a bear. We speculated that it had recently been run off by its mother and was trying to remember the techniques it had been taught as a baby bear. 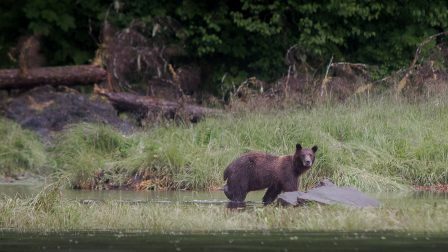 The bear was trying to pounce on the fish by running and jumping into the creek with its big paws spread wide. Each time it came up empty pawed. We watched it for over an hour. The next morning, the bear, which we affectionately started calling Little Bear, was back on the beach at low-tide. We found it at a different braid of the stream while we were exploring the bay in the skiff. Little Bear was again working on the nuances of fishing, and it appeared it was still coming up empty pawed. Jeffrey kept the skiff offshore in deep water, but close enough that we could watch. Little Bear, strutted around in the water looking for fish. When it found some, it would pounce, and splash, and pounce again. 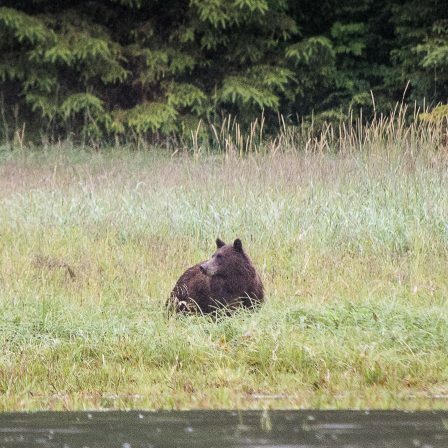 When it noticed us watching, it ran a short distance along the shoreline with an attitude that suggested we were not welcome to share the fishing hole. Jeffrey backed the skiff. Little Bear was satisfied that we were not a threat, and went back to fishing. As I’ve thought about Little Bear this fall, I’ve come recognized how hard it is for animals to make it. A young bear has a lot of obstacles to overcome. 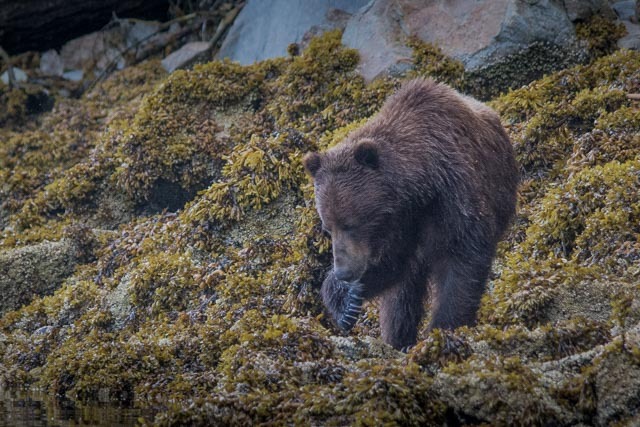 Young bears don’t often get the best places to forage for food, or the best territory. Young bears like Little Bear are a lesson in persistence. They have to keep trying to catch those fish, no matter how many times they come up empty pawed. That’s what I love about watching wildlife. Life lessons. Lessons that make me smarter, wiser, and more in tune with nature. As winter sets in, I hope that Little Bear is fat and happy with a big belly full of salmon. 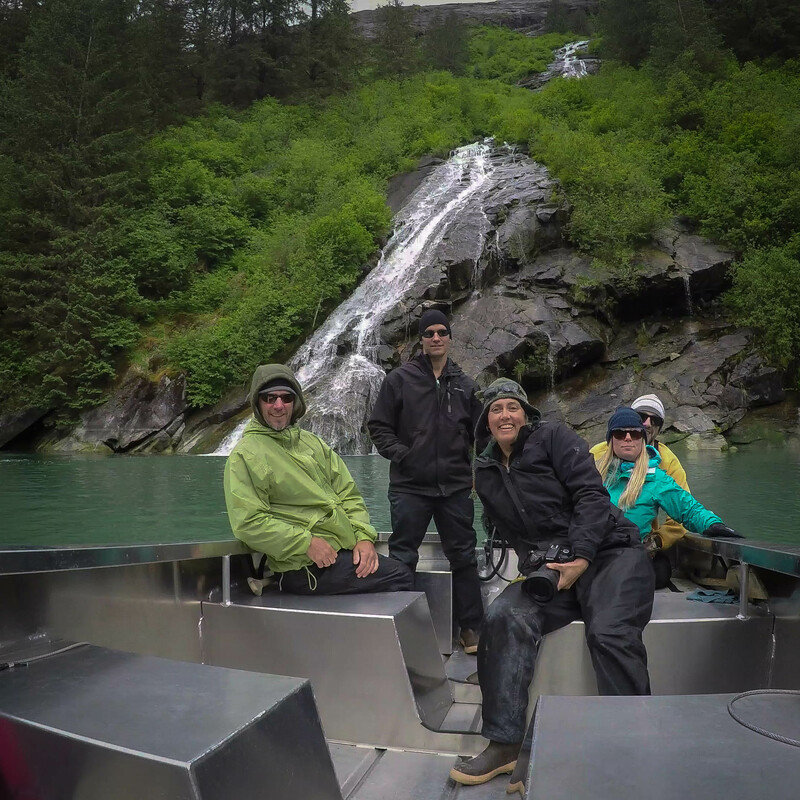 PS – If you’d like to have an experience like this, be sure to visit our Alaska pages or simply contact us. Jeffrey and I would love to share moments like this with you. Calm morning at anchor in Tarr Inlet with Margarie and Grand Pacific Glaciers. One day in May we anchored the David B in Tarr Inlet. We were in the middle of our Glacier Bay Photography Cruise. It was a beautiful, clear, sunny day with both the Grand Pacific Glacier and Marjorie Glacier in view. Marjorie had been active. The floating ice that had calved off was scattered all around the inlet. Most of it was of small bits of brash with the largest icebergs about the size of a city bus. 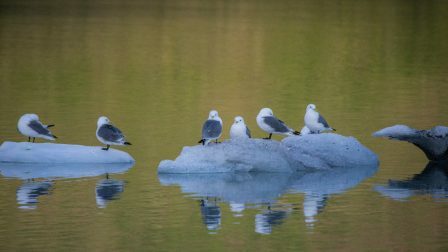 On both large and small chunks of ice were little gulls called black-legged kittiwakes — my favorite bird of the moment. Not far from our anchorage there was a cliff with hundreds more, some on nests, some circling in the air, making the cliff face a distant bee-hive of activity. Several flew past the David B making their distinctive “ki-ti-waak” call. The call is how they got their name. 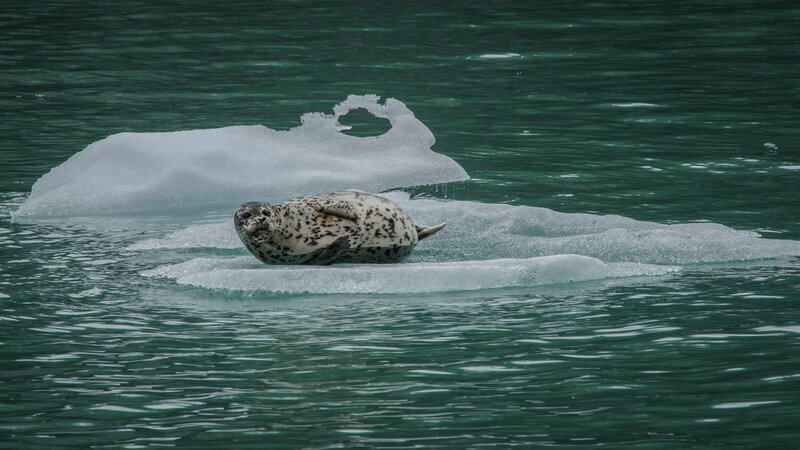 They frequent places like Glacier Bay to nest during the summer months then spend their winters off-shore. 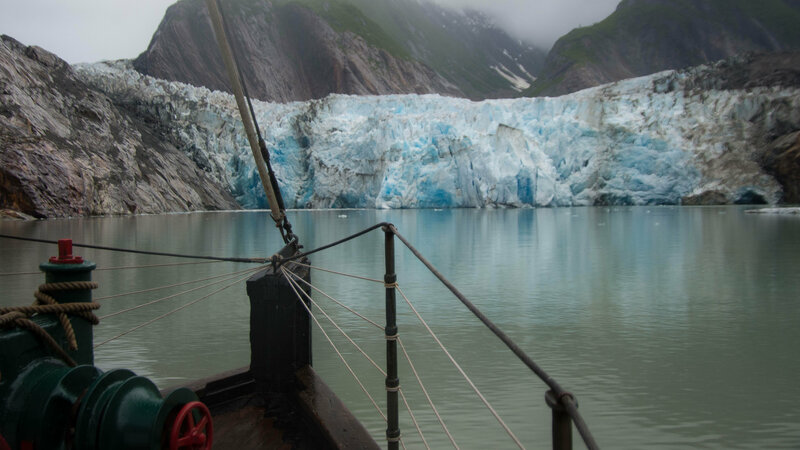 Not long after the anchor was down we all got into the skiff with our cameras and favorite lenses to skiff over to Marjorie Glacier. On the way we made a special side trip to the cliff with the kittiwakes. With our lenses pointed up and with stiff necks, we shot photos. From my sea-level vantage some of their nests seem to cling precariously to the cliff. We listened to the chatty colony. In the skiff, we were lost in our own photos, watching, listening and concentrating on our own individual birds. We checked exposures, and asked the instructors questions while we took in the dramas that were unfolding in front of us. There was the thrill of wondering what was going to happen next. 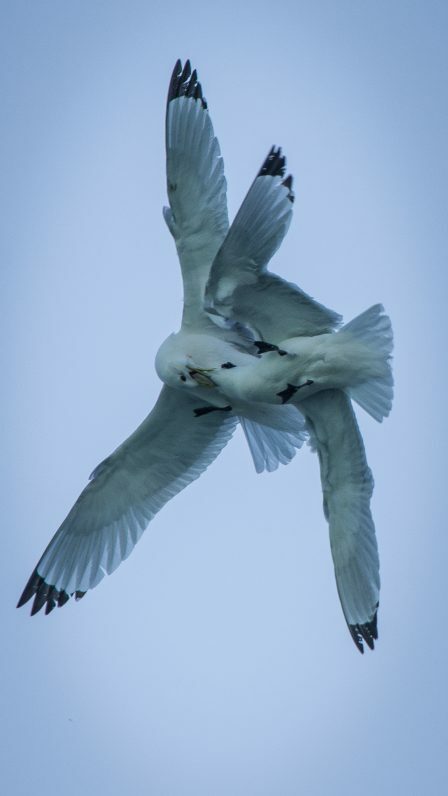 Occasionally two kittiwakes would engage in an aerial dogfight. The combatants would lock beaks and come tumbling and cartwheeling out of the sky, sometimes hitting the ground or water, or even tumbling down the cliff and landing in the fjord. At one point a bald eagle flew towards the colony. Would the eagle steal a chick, or would it just perch? How would the colony respond? We trained our lenses, and talked about what was happening. The eagle circled a few times, to the great displeasure of the kittiwakes. Their cries were almost deafening, then finally it perched on a ledge away from the colony. It kept to itself and sadly was too distant for a good picture even with my zoom. 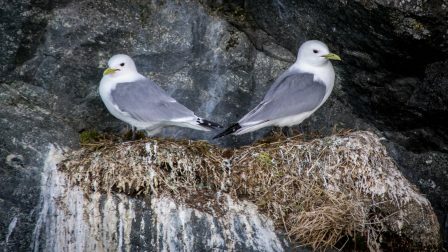 With all the excitement, I kind of lost track of time, so I’m not sure how long we spent at the cliff before moving on to Margarie Glacier, but it long enough that we got to enjoy watching, photographing, and chronicling a tiny snapshot of life in a black-legged kittiwake colony. I came away with a deeper love for these birds and the lives they live, and I’m sure the others in the skiff with me came away with their own interpretations and appreciations. As I go through my photos from this year’s Glacier Bay Photography Cruise I can’t help but feel the growing excitement that we’ll be back again next spring for two more Photography Cruises in Alaska with instructors John D’onofrio and Alan Sanders. One in Glacier Bay and the other in Tracy Arm / Fords Terror Wilderness and the Admiralty Island / Kootznoowoo wilderness. I’m excited because it’s a chance to get out in the wilderness, use my camera, see nature, and learn more about taking better pictures. If you’d like to know more, visit our Glacier Bay Photography and Alaska Photography pages and our schedule page for dates and availability, or contact us. Earlier in the day we were underway and heading into Holkham Bay with the intention of going for a hike on Wood Spit. Off in the distance, we spotted a couple of killer whales. They were moving fast and entering the bay. We tried to follow, but lost them as they swam quickly and entered the adjacent Endicott Arm. 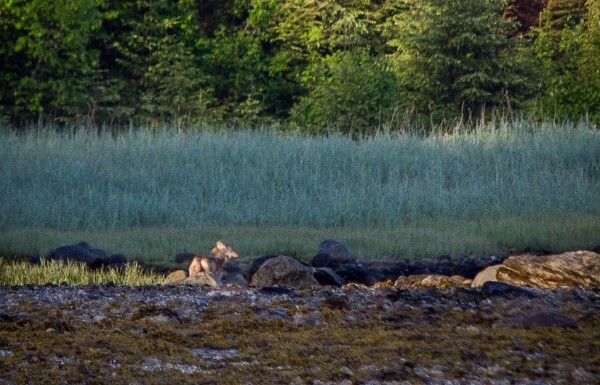 Jeffrey and I talked about the likelihood of seeing them again after our walk at Wood Spit. So we anchored the David B, lowered Skiffy-a-saurus into the water, and off our group went for our walk. We poked around in tide pools and looked for bear tracks in the mud and sand. We entered the forest and felt the squish of thick moss on bear maintained trails. We identified plants and talked about ecology, and spotted a black bear. At one point Jeffrey radioed me to say that Wilderness Ranger Chrissy was nearby and that we could meet up with her on the beach. After a little planning, we set out across the spit covered in shoulder-high ferns to meet Chrissy and talk about the wilderness area that was all around us. 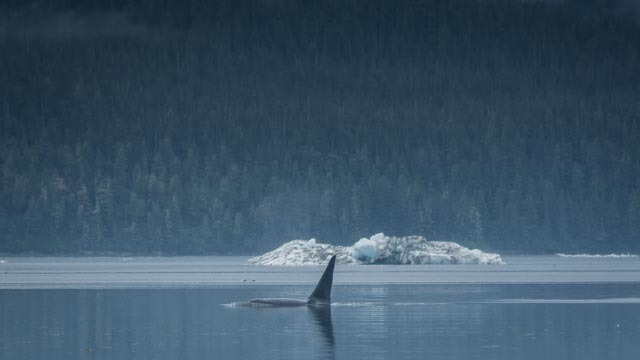 While we were chit-chatting, we heard the distinct blow of a surfacing killer whale. It stopped all conversations. 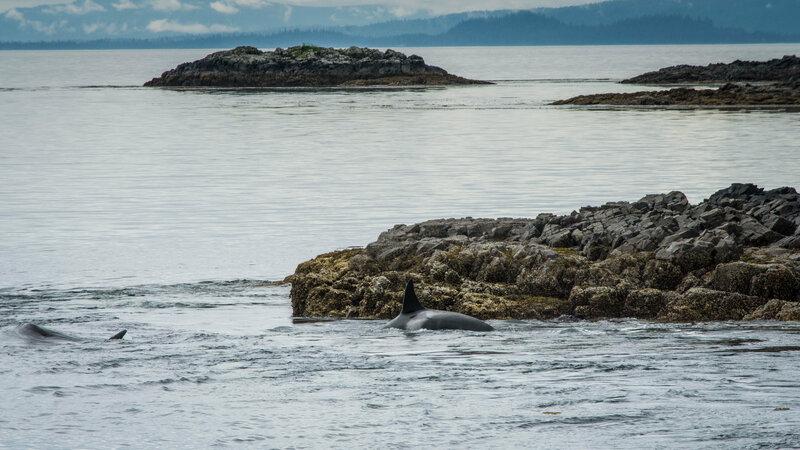 We watched mesmerized as two mammal-eating killer whales searched the bay for food. They came within 200 yards of the beach, and we were transfixed as they skirted shallows and searched icebergs. It was a beautiful encounter and we watched them swim round the end of the point. We thought it was the last we’d see of them…we were wrong. We said our goodbyes to Ranger Chrissy and radioed for Jeffrey to come pick us up. On our way back to the David B, the whales surfaced next to us. For the next hour the whales showed us how to hunt seals. We sat in the skiff with the motor off. The whales swam in circles at times, or in straight lines. They alternated which one was at the surface. We watched them make a kill. Their speed and grace was amazing. It was pure nature and we got to watch. It was a chance encounter and another chance to discover more about a world we seldom see. We built a new skiff for this season and we’ve been really loving how much it’s changed things. It was kind of a last minute decision, and the builders really rushed to get it done for us. We only loaded it on board the day before our season started, It’s huge by comparison to our old skiff (which by an interesting requirement at the Alaska Department of Fish and Game, had been known as Skiffy.) The new one is so big (to us) that we named it Skiffy-a-saurus. We use it for all the things we used to do. It’s really good and stable (people can stand up and move around while we’re moving) and it easy to climb in and out of at the beach. We’re using it for getting into kayaks too, but but now we’ve added a couple other activities to our skiff repertoire. The best one– skiff exploring. We didn’t use Skiffy much for exploring, because it’s capacity was so limited, usually only half the group, but now, everyone can go at once. Now when we get to a new cove or harbor and drop the anchor, we all pile in Skiffy-a-saurus and head out to explore the shoreline. We putt along at 3 or 4 knots, sometimes shutting down the motor to drift and listen, and really get to see what’s there. On this last trip alone, we watched eagles and gulls, saw deer feeding at the water’s edge, spied on crab crawling across the bottom, even drifted while harbor porpoises and icebergs circled the boat. But the best one yet… We watched a brown bear right up close! Barnacles for Breakfast – Paw licking good! It was morning, just before breakfast. The sun was lighting up one side of the little fjord we were anchored in. The other side was still in the shade. A brown bear swam across from the sunny side into the shadows on the other side. It was probably a half a mile down the shore. We watched it for 15 or 20 minutes, then Christine suggested we go take a look with Skiffy-a-saurus. Everyone got their cameras, and we all quietly climbed in. I headed us over to the shore, then hugged the shore as I idled us close to where he was. 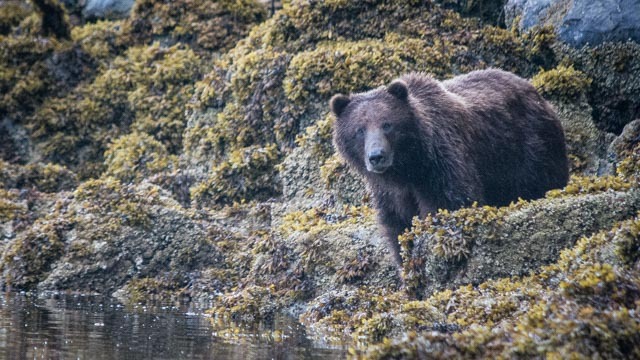 At about a hundred feet from the bear, I shut down and let the tide carry us along the shore. We were just feet from the rocky edge. Slowly we got closer and closer, The grizzly didn’t seem to notice (or care) that we were there. No one made a sound. When we were even with him on the beach we were probably only 30 feet away! About 15 of that was deep water, so we calmly took pictures and watched as he poked among the rocks, eating barnacles and mussels. Then we followed him back down the beach for almost another 10 minutes. It was fantastic. Chalk another one up for Skiffy-a-saurus because this moment was only possible because of it. On the David B we like to do what comes along. We do have a schedule like everyone else, but a lot of times we change it to respond to the moment. We don’t want to miss anything. So that’s why I was a little taken aback when I tried to help out another boat that was nearby so that they would see some orcas we had just spotted. 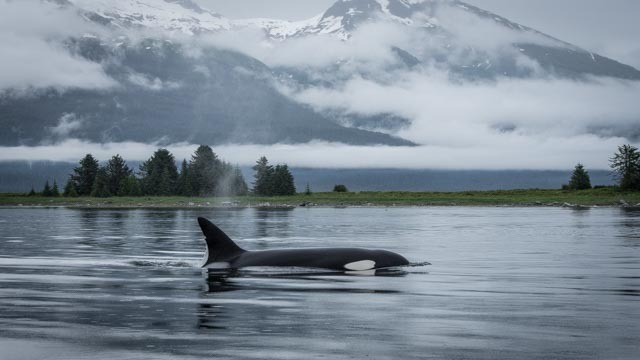 When we find wildlife, especially something as cool as transient killer whales, I typically radio other boats that are nearby to make sure they’ll get a chance to see too, (and hopefully repay the favor later). Then there’s usually a radio discussion about how we can all maneuver so as not to be in each others view. I politely, and a little excitedly made the call. Then the whales turned around, so we moved to follow them, I called again. All of our guests were out on the deck taking photos and loving the show. Josh McInnes, our guest naturalist and whale biologist was explaining what we were watching as it happened, play by play. What??? I was unable to believe. How unfortunate for those folks, because in 20 minutes the orcas might slip away. Our chef was out on deck with the whales. Our galley was unoccupied. We were with whales! Over the next few minutes the pod slipped through a narrow passage, so we followed. Then they reversed course, and swam right past us, and caught an unsuspecting harbor seal right in front of us. It was amazing. There was even a brand new unknown calf in the group. We might have been the first humans to see it. We turned around and stayed with them for almost another 30 minutes. I love our ability to be unscheduled. We go where the wildlife is when it’s there and happening. We actually saw the hunt, the capture and the kill. Food, for us, can wait. For the bigger boats, I understand, they need to be scheduled. But I really think our guests get a better trip. Even if we are unfed. Where is the David B? Usually I have to guess based on our sample itineraries, but now I don’t have to! 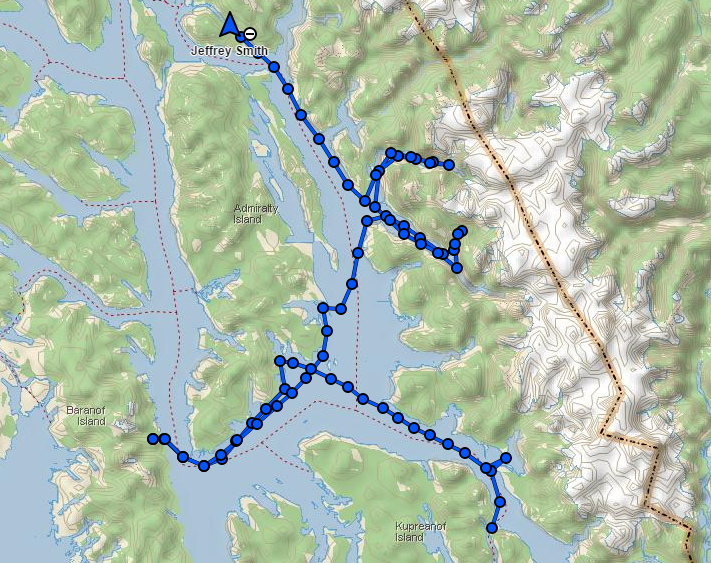 I really like this screen shot of trip #297 (see the trip recap below) which shows the David B heading Northwest out of Petersburg, going around Admiralty island to visit the Baranof Warm Springs, with side trips to see Ford’s Terror and the Sawyer glacier before arriving in Juneau. Here is another Trip Recap of Alaska. This time it’s our Northbound cruise out of Petersburg arriving 8 days later in Juneau. 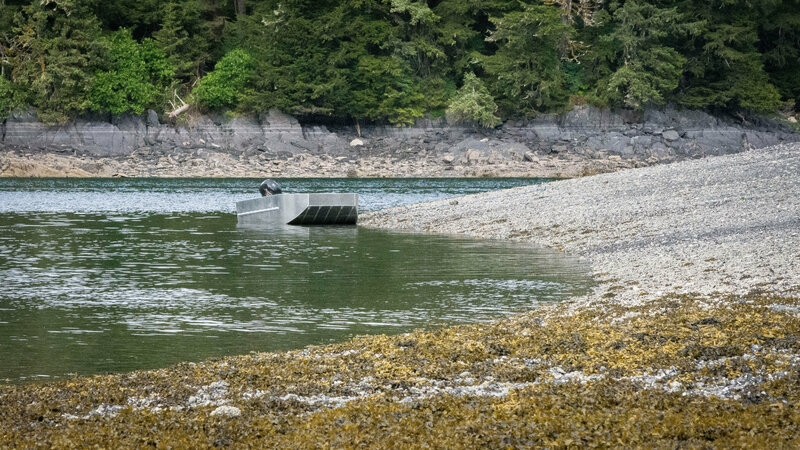 Day 1) 10 June – Thomas Bay – We left Petersburg and stopped to see the local sea lions hauled out on a buoy. 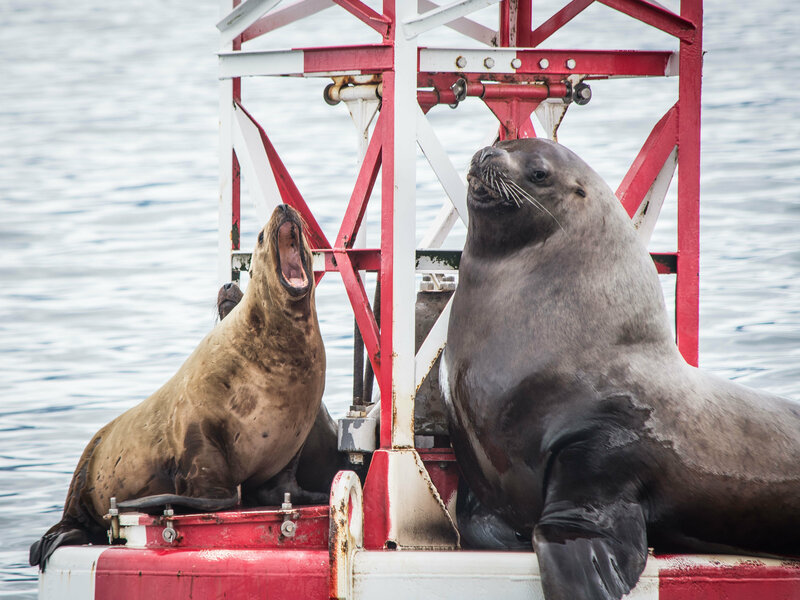 The sea lions were very expressive as they tried to jockey for space on the buoy. Anchored in Thomas Bay. Skiffed around Ruth Island and tucked into a narrow cut to look at an overfall coming out of an unnamed lagoon. We saw a Bald Eagle and a small weasel, one person thought it was a fisher another thought it was a mink. It was too far away to tell. 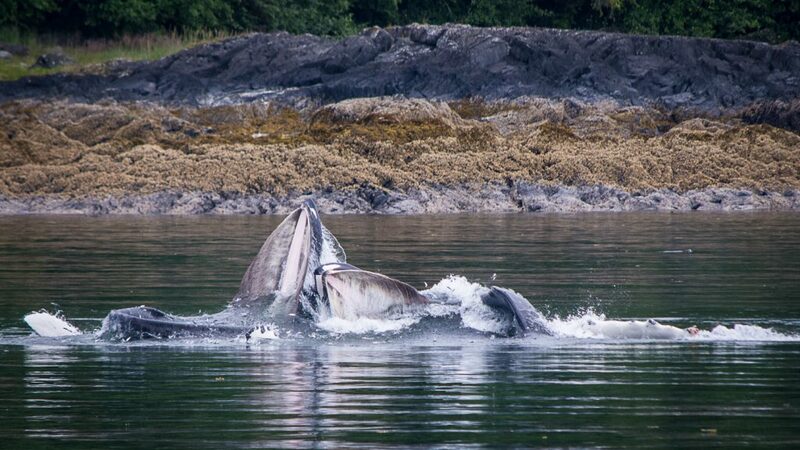 Day 3) 12 June – Watched more humpback whales on our way to Baranof Island’s Warm Springs Bay. Everyone went ashore and soaked in the hot springs. Christine was excited to have Rufous Hummingbirds come to the feeder. 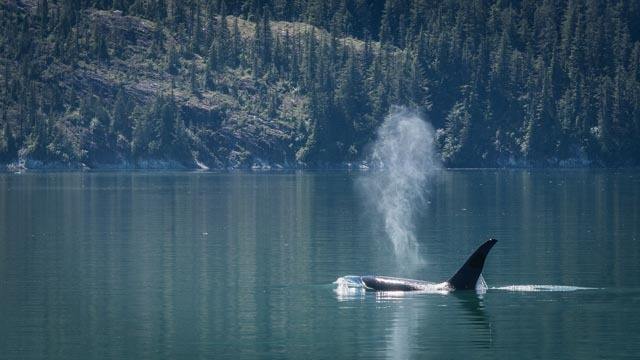 Day 4) 13 June – Left Warm Springs Bay and after being underway for a little more than an hour, we found a pod of six killer whales. 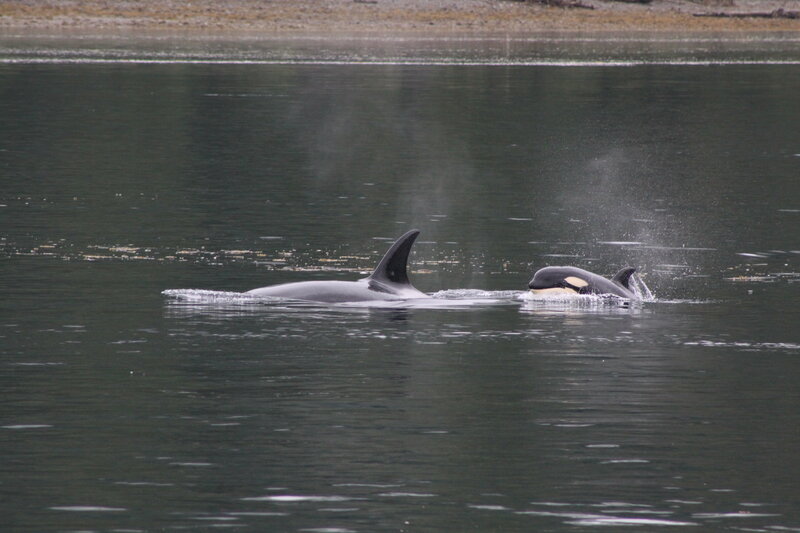 We hung out with them for about an hour before continuing on to Gambier Bay on Admiralty Island. Day 5) 14 June – In the morning we timed a shore excursion for a low tide walk to do a little tide pooling and then to duck into the forest to see what plants were in bloom. We found Calypso Orchids, Tiny white Shy Maiden, and the unusual ground cone to name a few. On our way to Holkham Bay, we were visited by several Dall’s Porpoises who rode the bow of the boat. We also got to stop and watch several humpback whales feeding in the middle of Stephens Passage. In the evening we anchored in Fords Terror. Day 6) 15 June – Everyone got up early to catch the right tide for skiffing into the back of Fords Terror. It’s a beautiful steep-sided fjord that is only accessible through a narrow cut at slack water when the current running slows. After breakfast we went ashore to look at several icebergs that had come off of Dawes Glacier. The icebergs had floated into Fords Terror and grounded on a sandbar. 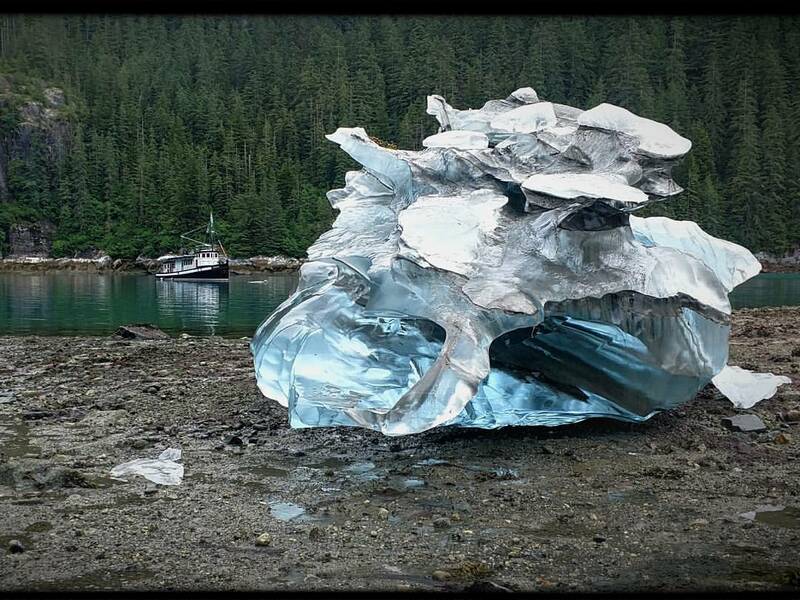 There was one of the most beautiful icebergs we’ve ever seen sitting on the beach. Christine would have spent all day with if she could. The David B anchored near a gorgeous beached glacier at Ford’s Terror. Day 7) 16 June – Left Fords Terror for Tracy Arm and Sawyer Glacier. We got the glacier around 6pm and had the whole glacier to ourselves. Later that evening we anchored at Tracy Arm. Day 8) 17 June – Left early in the morning for Juneau. Had a lovely trip with some of the nicest folks! If Alaska is too much for you, we still have plenty of spots available for our San Juan Island 4-day and 3-day escapes once the David B returns from Alaska in August. Just look at our Schedule and then email Sarah@northwestnavigation.com to reserve your spot today! Sometimes the quickest animal sighting stays with me the longest, especially when it comes to elusive wildlife. This past week while I was making coffee, I happened to catch some movement on the beach out of the corner of my eye. I paused the coffee grinder and looked with intent as a wolf ran along the shore. “Where’s my camera, where’s my camera,” I whisper-shouted to Jeffrey. “What’s wrong?” Jeffrey answered back, not fully understanding my question so early in the morning. “Wolf. Beach. There.” I pointed out as I found and aimed my camera – clicking rapidly before the “wild brother” disappeared back into the forest. The wolf trotted along. Stopped to sniff the ground several times before leaving. The whole encounter lasted not more than two minutes, but even now as I write a week later, I still get goose bumps knowing I got a glimpse of a wild wolf. For me, wolves are special. We rarely see them. In twelve years of running the David B, this is only the fourth time we’ve seen wolves. It was a treat, and one that I’m happy to share with you. Also, Christine’s Meal highlight – Smoked Black Cod Risotto with caramelized onions, and mushrooms. Yum. When the Tin Hat Project was being built, Jeffrey also decided to build a new skiff with some very unique features. Glacier Bay is really, really amazing. When we left for “the Bay” a week ago, I had this feeling that I always have as we depart — what will we find on this adventure? It’s not about the things that we see on almost every trip, like the whales or the glaciers. It’s the new things: the places we haven’t seen before, the wildlife we find that isn’t on our other trips, and the guests, many of whom we’ve never met before. The best part is, we found lots of new things. 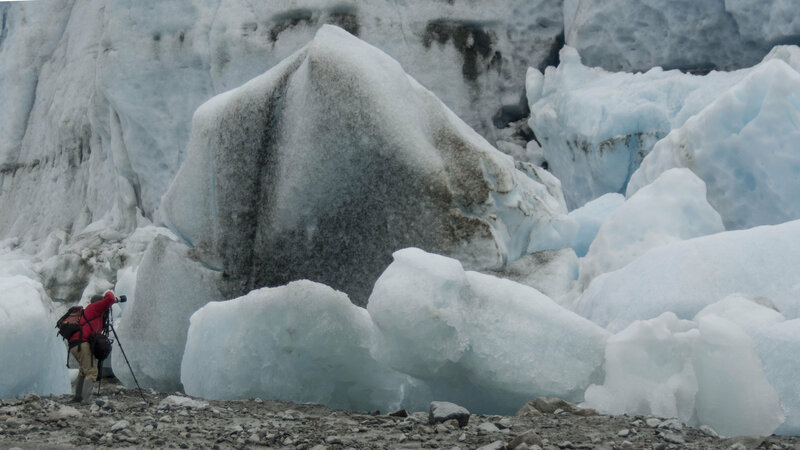 We got a great tip from the rangers at Bartlett Cove who suggested we anchor near the McBride Glacier and walk the beach at low tide amongst the grounded icebergs. It was beautiful. It was a sculpture garden of ice, pieces as small as a baseball to pieces as large as a truck. The photography possibilities were absolutely endless, and it was a photography trip, of course. The McBride glacier calves bergs into a narrow river that flows out to Muir inlet, but just at the confluence, the river narrows and shallows and the bergs get stuck. More and more come down the river and crash into the already grounded ones. Then, as the tide goes out, you can walk around them on the beach as they lay at all sorts of crazy angles, waiting for the next tide to float them free again. One of the photography experts and trip leaders, John D’Onofrio, thought it was the most beautiful place he’d ever been. Along the way there were classes on photography and post-processing of images, light and color and lots more. Alan Sanders, our other trip leader, taught along with John, and no one lacked for good subject matter. It was everywhere. The evenings were full of photo critiques and wonderful meals. A few days later, having spent the night in front of a receding glacier, we went to the entrance to Johns Hopkins Inlet and stepped up the amazement level again. The glacier is tucked back into the Fairweather range and has almost vertical snow covered sides extending 5 miles back to the glacier front, and the valley goes miles beyond, as the glacier swoops out of sight into the mountains. We even witnessed a thousand foot avalanche beside the glacier. This was almost too much, and even John had to call for a mid-day break. Everyone need some time to absorb the amazement and the wonder of the place. It was indescribable. Of course, never wanting to back off the pace for a moment, when people awoke I loaded them in the skiff and we went for a 2 hour ride (in the sun) to watch another glacier, the Margerie glacier calve.